The arguments I’m hearing about the Ferguson case are just fantastical. Michael Brown was a big man. He robbed a convenience store. The evidence about what happened on August 9 is contradictory. What distractions! You don’t gun down an unarmed person in the middle of the street shortly after telling the person to walk on the sidewalk. You just don’t. Yes, once the case enters the legal system, it’s relevant that the law protects police officers when they use lethal force. Rules of evidence come into play. Definitions of manslaughter do as well. Michael Brown’s death does not have to get tangled in our complicated legal system, however. To argue this case on legal grounds does not address the legitimate grievance that lies at the bottom of this resistance movement: police officers mistreat black people, black men in particular. Stay focused on what counts here. Everyone wants to argue whether the grand jury in Ferguson should have indicted Officer Wilson. People are angry that the justice system did not find probable cause to charge Wilson after he pumped round after round into Brown after a brief altercation. The community’s grievance, though, is not against Wilson only, any more than Wilson had anything personal against Brown before he told him to get off the street. The community’s grievance against Wilson is against the entire Ferguson police department. With Brown’s death, the community’s anger became public, after years of mistreatment. Arguments about whether the grand jury should have brought a formal indictment don’t address the issue the protesters in Ferguson raised in the first place. A man runs away from a burning storage facility after the announcement of the grand jury’s decision on Monday, November 24, 2014, in Ferguson, Missouri. Violent acts against local business owners, or against anyone else, do not address the issue either. The whole country is looking to Ferguson as a model for how to resist law enforcement authorities that have come to resemble the Hunger Games’ peacekeepers. The peacekeepers execute troublemakers in public, which is exactly what Wilson did. It does not matter that Wilson perceived some level of threat against himself. Whether or not Brown is a petty thief does not matter. The moral issue of mistreatment matters. What matters is what witnesses saw: a peacekeeper orders two troublemakers off the street. The troublemakers decline. About a minute later, one of the troublemakers lies dead on the pavement. The shooting is an extreme example of mistreatment that extends back for many years. A public execution on a Saturday afternoon? We’ve had enough! Everyone who has given the question thought, though, knows that letting anger turn into violence does not work. Targets and victims of abuse need to follow a rule of restraint: do not respond in kind when police mistreat you and use force against you. If you do, the police will win. Restraint, however, does not mean inaction. Restraint means planned, coordinated action that forces the moral issue. Lock arms, do not give way, dare the police to harm you. Choose the time and place of battle. Make sure people record what happens: the audio, the stills, and the video. Bring your protective gear. Be prepared. Help your brothers and sisters. Find ways to isolate your opponents and disrupt their communications. People in the military can tell you the importance of all these principles. Learn the art of war from Lao Tzu. Learn from leaders who know how to win. Follow their advice, except don’t use weapons of steel and fire. With discipline and persistence, leadership and planning, coordination and foresight, your opponents will disintegrate. They have no moral force. They act from fear and self-interest, not courage and devotion. Consequently, they are weak. I know Syria stands as an example of civil war that develops from civil resistance. Other non-violent movements have engendered violent conflict. Almost without exception, when non-violent civil conflict develops into civil war, the side with the most weapons wins. Non-violent resistance has the best chance of success. Remember Selma. Remember Birmingham. Remember the fire hoses and the police dogs. We remember those events more than we remember the burning of Detroit and Los Angeles. We remember the names of the leaders who organized civil resistance in Selma and Birmingham. 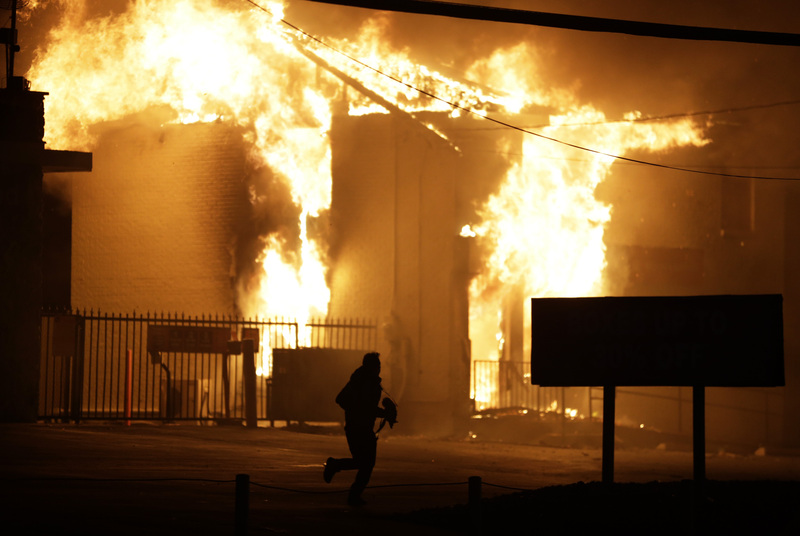 No one remembers the names of the looters, brick throwers and arsonists in Los Angeles and Detroit, or any of the other cities that have suffered riots through the decades. Riots do not have leaders. Riots get people’s attention, but they do not lead to the promised land. “I got there, it was self-explanatory what happened. Somebody shot somebody. There was no question as to any distances or anything of that nature at the time I was there.” ~ Investigator from the St. Louis County Medical Examiner’s office, in testimony to the grand jury about why he did not take measurements at the scene of Michael Brown’s shooting. Very insightful article Steven. Thank-you for your inspiring and encouraging material year round. Please be sure to let me know anytime you are going to be close enough for a lunch date in the coming year.